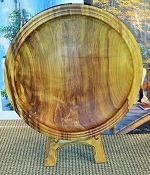 Although my first exposure to wood-turning was in school, in England, I did not pick it up again until six years ago. In the meantime, between raising a family and earning a living, I worked in various art forms. These included stained glass, pottery, leather and bead-work . I always seemed to have the need to "create" something. Even while working with heavy equipment I managed to satisfy this creative urge by building ponds and rock retaining walls in any down-time. Then one day I dusted off an old Shopsmith that had been my father's, and the addiction began. It was not long before I was craving a bigger and more efficient and -- oh yes -- a more expensive lathe. Then there were tools to buy and....and the addiction steadily grows. With each turned piece I try to duplicate the high of that first taste. Add to that the excitement of cutting into a piece of wood that would otherwise be relegated to the wood pile and discovering the beautiful grain patterns and colors that nature provides, and I was totally hooked. I soon discovered that wood was the perfect medium for my artistic expression. I am always on the lookout for suitable trees that have to be removed because of overcrowding, storm damage, or environmental reasons. I give these rejected trees a new life, that of art or function. Most of the wood I use is native to NW Montana. So here I am today, hoping that the fruits of my addiction will find a home with someone, whether to hold a salad, or to sit in place of honor on the mantle. No two pieces are ever the same. The forms may be similar, but the variations in grain pattern and color are endless. Even the way in which wood moves as it dries gives it its own personality. If you see something you like, I can make a piece that is similar, but I can never duplicate what mother nature has given to each piece of wood. Nor would I want to. I try to make a form that is pleasing to the hand as well as to the eye, and choose a finish that complements both. Most of the art pieces are finished with lacquer, then buffed and polished to a rich luster. Trene ware, or functional pieces are, coated several times with organic walnut oil, then sealed with Beeswax. I have recently had inquiries and orders for Cremation Urns, so those have been added to my production list. They are all hand turned on the lathe, each one an original. They are a carefully created piece of art that can be treasured by the family for years to come. Each urn has a threaded lid to safely secure the contents. I list the type of wood, finish used and volume in cubic inches. Commissioned urns can include artwork by artist, Lanie Meier. Please contact me for more information and specific requests. Concerning pet urns, the question has been about size. A 20 lb pet will require, approximately a 20 cubic inch urn, a 70 lb pet = 70 cubic inch, etc. Individual urns are 185- 285 cubic inches. The larger urn is required if keepsakes or memorable items wish to be included. Companion urns are typically 375 cubic inches and greater. They are designed to hold the remains of two average size adults. Keepsake urns are smaller. They allow memorials to be kept by several family members. A specific internal volume is not required. 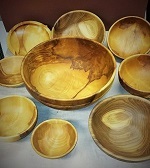 I am always pleased to accept calls or emails if you would like to discuss items that you have interest in, or even if you just feel like visiting and talking about woodturning.. Thank you for visiting my page, and I hope that you enjoy looking at my creations. Come back often, as I am continually adding new work, and please share with your friends.